Urbana University’s Matt Treacy (21) prepares to drive against UVa-Wise on Saturday. 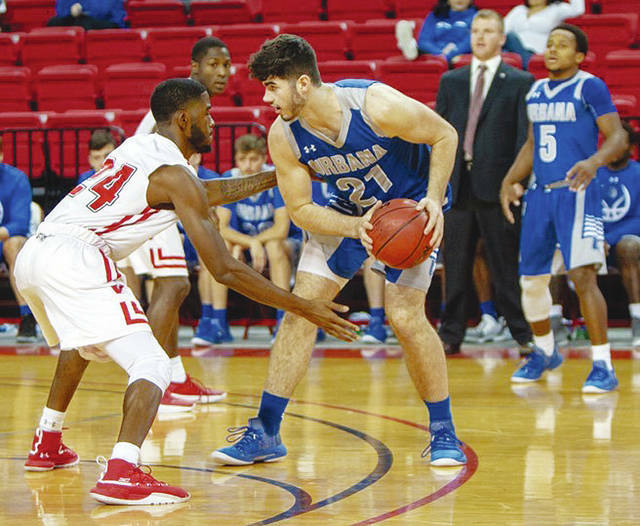 WISE, Va. – The Urbana University men’s basketball team dropped its conference opener Saturday to UVa-Wise, 93-70. UU remains winless at 0-2 (0-1 MEC) while the host UVa-Wise squad improves to 3-1, 1-0. Freshman Matt Treacy scored a game-high 26 points on 10-of-22 shooting and led the Blue Knights with eight rebounds. Senior Malik Jacobs also recorded double figures with 18 points and seven boards. Both teams exchanged blows early on with Wise running out to a 7-0 lead after the tipoff. Then, UU countered with a 9-0 run of its own which was capped by freshman Zach Bates’ breakaway dunk. The Blue Knights kept up the momentum as Treacy’s jumper at the 15:24 mark gave UU its largest lead of the game, 14-9. The two teams continued to go back and forth midway through the first period. Treacy buried a trey to give UU a 24-21 advantage at the 11-minute mark, and then freshman Hadley LeVan came off the bench and kept the lead at three by drilling a three with 9:45 left in the first. That was the last lead UU would hold after the Cavs closed the opening half on a 21-8 run that spanned the final six minutes. Wise shot 62 percent during the first half and out-shot UU, 56 percent to 41 percent, overall in the game. The Cavs did damage inside with 48 points in the paint and also knocked down 8 of 14 three-point attempts. Michal Seals led with 22 points, seven assists and three steals. Eric Okenchi added 16 points while Briggs Parris went 4 of 4 from beyond the arc for 12 points. UU turned the ball over 19 times with Wise giving up the rock 16 times. The Cavs were credited with 15 steals while the Blue Knights had only two. In the second half, the Blue Knights never trailed by less than 13 as the Cavs’ lead swelled to as much as 29. UU will hit the road for a 3 p.m. conference matchup against Concord (2-2, 0-1 MEC) today. The Mountain Lions dropped an 80-69 decision to Notre Dame College on Saturday. https://www.urbanacitizen.com/wp-content/uploads/sites/36/2018/11/web1_treacy.jpegUrbana University’s Matt Treacy (21) prepares to drive against UVa-Wise on Saturday.